The Bring Back The Loggerheads campaign is a not-for-profit venture and all items will be sold strictly at cost price. Transactions can be completed either in person, or through PayPal. 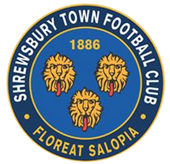 Thanks to the initiative of a Shrewsbury fan based in Germany, we have a number of iron on patches available for sale. Each patch is sized 7.5cm x 7.5cm and can be easily transferred over the current clip art lion logo. 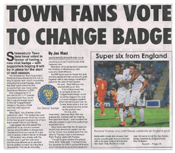 Simply place the patch over the offending article, cover with a tea towel and apply a hot iron for 2-3 minutes. 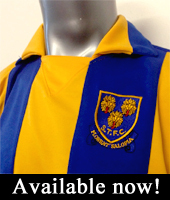 A replica shirt can be transformed in just 180 seconds! Available now for just £2.00 each. Postage and packing provided for £1.25. The t-shirts are made from good quality, heavy cotton and feature the iconic leopard heads which have been associated with STFC for well over 100 years. Available now for £6.00, postage and packing provided for an additional £3.99. Please email us at loggerheads@post.com with the size of t-shirt and quantity you require. Floreat Salopia. Stickers are 8.5cm high + 8cm wide. P&P available for an additional £1.99. 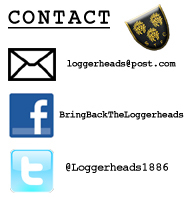 Email us at loggerheads@post.com for more info.